This PDF 1.5 document has been generated by Microsoft® Word 2010, and has been sent on pdf-archive.com on 17/01/2017 at 10:03, from IP address 37.231.x.x. The current document download page has been viewed 800 times. File size: 347 KB (4 pages). IOS and Android applications using various development tools. instrumental in architecting, designing and implementing and delivering mobile applications. delivers over 95% recognition accuracy. senior project consultants in this domain for the last three years. language ( complex connected script) that delivers over 95% recognition accuracy. 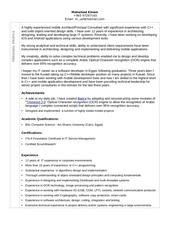 Experience in software architecture, design, coding, integration and testing. 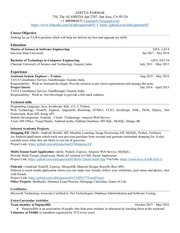 Expert in C++ programming, Object Oriented Design, and Design Patterns, REST, JSON and XML. Mobile app (iOS, Android, Windows Mobile) for the employment service in Kuwait. and select their favourite jobs from a list of available jobs. Design the architecture of the cross platform app. Build interface units for each exchange type. was developed using Microsoft Visual Studio .Net. Work with the HIS team to design the integration APIs . Provide the solution architecture based on XML and HL7 standards. Implement the solution using Microsoft Visual Studio .Net. system at MOI to validate transactions as part of the workflow. This file has been shared by a user of PDF Archive. Document ID: 00537823.